I have a couple of blood oranges on hand and always have dried cranberries in the pantry. Cranberry-Orange Scones coming up! We’re in the midst of our first big snow storm for 2017, expecting somewhere between 6- to 12-inches. The plow guys are here now for the first plowing and it looks like we’ve easily hit the 6-inch mark. They’ll be back later in the day, after the snow ends to clean up the rest of the downfall. It’s windy, that howling wind that tells you it’s bitter cold outside – BRRRR. My weather app says the temp is 26, but “real feel” is 4 degrees. Glad I’m inside. 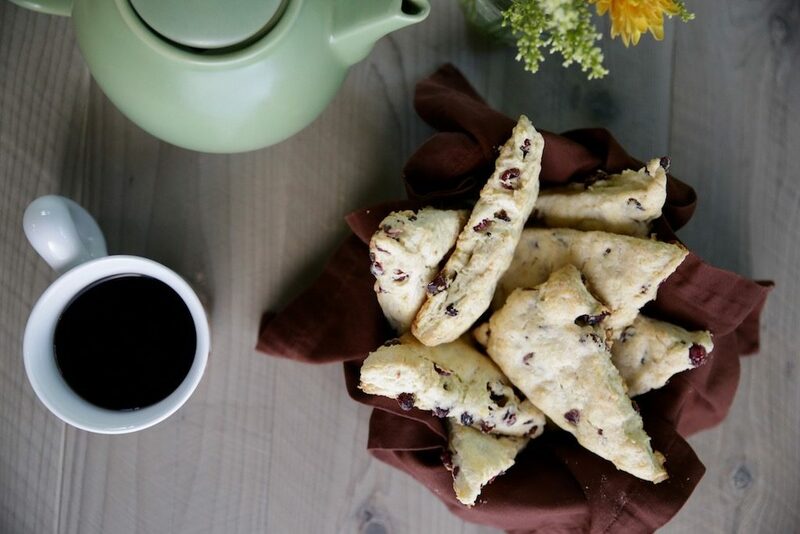 Once these delicious scones come out of the oven, I’ll be sitting by the fireplace with a cup of tea and a warm, aromatic, delicious cranberry-orange scone. Stay warm and cozy friends! 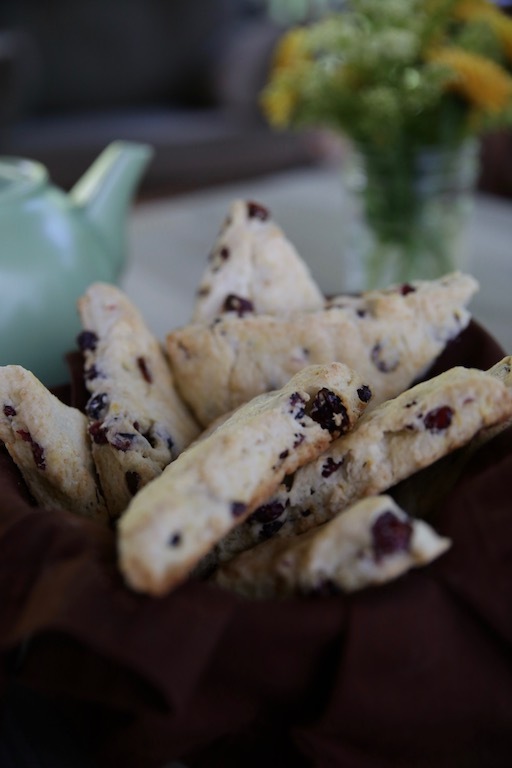 A delicious start to any morning or with a spot of tea in the afternoon, Cranberry-Orange Scones are always a welcome treat! Preheat oven to 450º F (232º C). Mix flours, baking powder, sugar, and salt in a large mixing bowl. Slice in butter into 12 pieces and cut into flour until butter is size of peas. Mix in dried cranberries and orange zest. Push flour mixture to sides of bowl, making a well in center of bowl. Pour cream into well, and cover with flour mixture. Mix gently, a minimal amount of mixing and kneading produces a light, delicate scone, until all ingredients are wet. Lightly dust work surface with flour and gently knead dough 10 times. Form dough into a round. Roll dough to 1/2-inch thickness and slice into 8 wedges. Place on ungreased cookie sheet and bake in preheated oven for 10 minutes or until lightly browned.